I had two Seamaster 8800s (different colors) at the same time and I noticed that on one of them, the lume in pearl pip was slightly "weaker" than the other when both were given equal light. Maybe it wasn't weaker and it's possible that the other one just had an extraordinary strong lume on the pearl pip on the bezel. I did notice that both had equal lume on the dials, however. I attached a photo of the lume of the pearl pip that is the "weaker" one for reference. This photo was taken seconds after a full charge. The other Seamaster pearl pip had an even brighter lume, but not my much. Does Omega quality control of new watches cover testing the luminescent properties of the watch? If so, do they allow some variance in the lume between two of the same types of watches? The reason why it looks weaker is simply due to the fact that the pip is such a small and shallow area for them to apply the lume that it just looks dimmer in dark. This would be my answer, I am sure they QC just about everything on these watches now that they are META Certified. 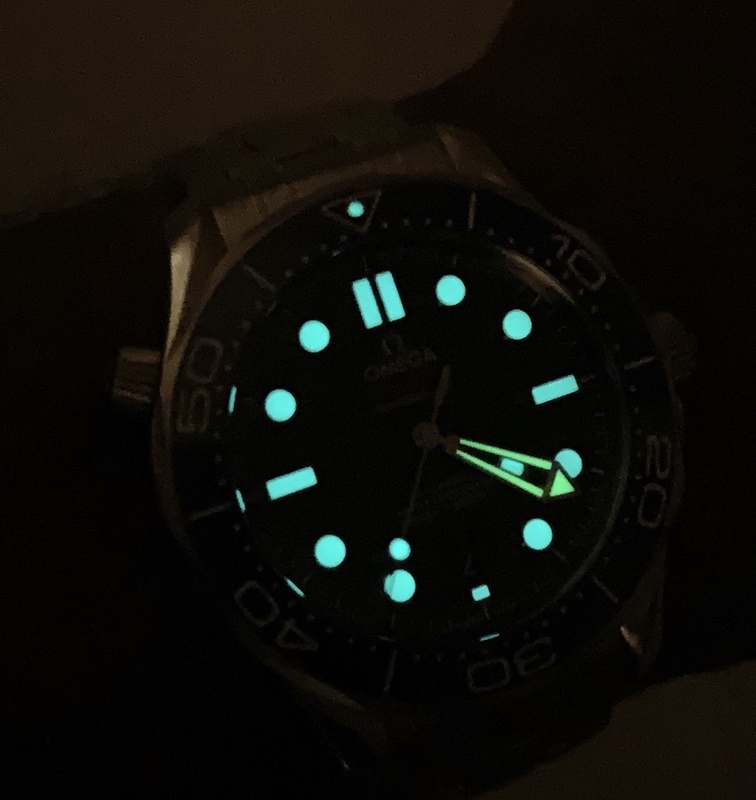 From my personal experience with Omega divers (had an 8500 PO, seamaster pro 300 ceramic 2500, seamaster 300 master co axial) their lume has been a bit inconsistent. The worst was with my PO. The minute hand had significantly weaker lume in the center where it was very obvious. I had it under warranty but OB gave me a hard time getting it replaced. The SM pro was good and the 300 coax has a bit weaker lume on the hour hand. It's not so obvious but is apparent when you look closely. Also, a side note, Omega's diver bezels are horrid :( I hope they fixed it with the 8800 series. Here is mine for comparison. Why don't you contact Omega about this? How would we know? I did contact Omega and they didn’t answer my question in a straight manner. They just said all their watches go through extensive QC and if I feel there’s a problem I can send to them.